Joel Stenberg's blueprint for his new coffee shop is simple and yet audacious. 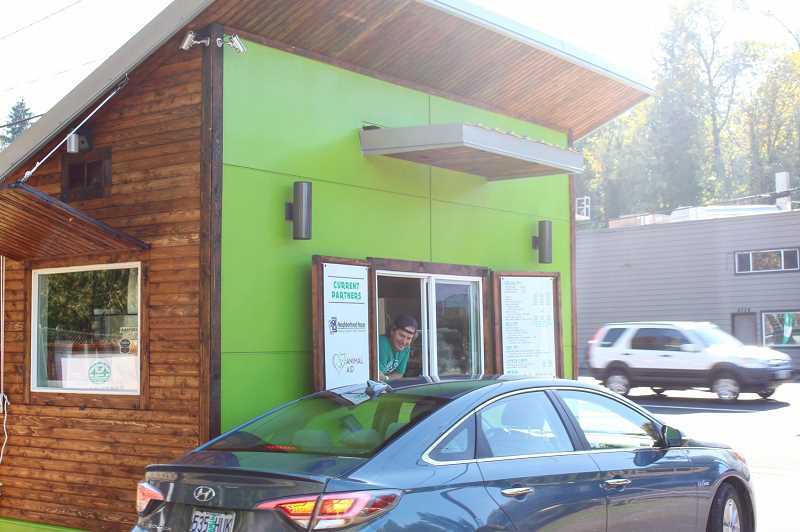 He aspires to hand customers a cup of coffee worthy of Portland's finest cafes through a drive-thru window while donating 10 percent of the proceeds to local community organizations. Stenberg hopes the combination of café-quality products and philanthropic ethos leads coffee and espresso drinkers to his window. "I'm shooting for the target market," he said, "that says, 'Why can't we get that cup of coffee that we get in a café through a drive-thru?" The shop, Green Bridge Coffee, recently opened on Beaverton Hillsdale Highway near Albert Kelly Park. Currently, 10 percent of its proceeds go to two Southwest Portland nonprofit organizations — Neighborhood House and Animal Aid. "It's not a traditional business model and I think it weirds people out sometimes. They're always looking for the catch. The prices must be higher or it's 10 percent of profits. No, the prices are really comparable to everyone else and it's 10 percent of proceeds right off the top. Whatever that bill is, move the decimal over and that's what you're giving for that day," Stenberg said. Stenberg has spent the past 10 years in other realms of the food industry — working for Sonic Burger, Papa Murphy's and Freshies Food Corporation. For six years, he dreamed of operating his own coffee shop, one that sells a cup of Joe that isn't bombarded with sugar and other extraneous flavors. However, his shop does have such flavoring for those with a sweet tooth. "'Good' is up to whoever is drinking the coffee, but I know that the competitors, I haven't worked behind those counters, but the drinks that I receive are very sugary. It's hard to taste the coffee in there," he said. The problem was, Stenberg didn't have much coffee-making experience. So he took classes from Nossa Familia Coffee and completed Tabor Space's training program, where he learned how to pull espresso shots correctly, extract coffee beans and other techniques. "Before that, I felt like I had all this food-service experience, customer service, management in an environment I was stepping into, but coffee I didn't have much knowledge of. Six months later, walking out of that program at Tabor Space, I felt very confident," Stenberg said. With the help of a silent partner as well as a Gofundme campaign, Stenberg bought the drive-thru space once held by Coffee Cartel. And then he added an altruistic touch to the operation. Stenberg called up Neighborhood House and Animal Aid to see if they would be willing to partner and agree to take in 10 percent of Green Bridge's proceeds, and to refer customers to Green Bridge Coffee. Stenberg gleaned the idea for the 10 percent donation from the Biblical tide. "Looking for ways to connect to your community and give back to people has always been in my heart. I haven't had a ton of money growing up, and my time has been spent getting an income like most people. I just decided to try to figure out a way to have a job, make money but also be able to give back to the community," Stenberg said. Stenberg hasn't hired employees yet but says his business is sustainable despite the donations.
" It means there isn't 10 percent landing in my pocket, but that's fine. That's what I want to do," he said. Every quarter, Stenberg will align with two new organizations. His criteria for partnering organizations include locality and community benefit. "I want people to understand that Green Bridge Coffee is really here to serve the community. We're not here to get crazy rich and then disappear," Stenberg said.